Also..notice the wires coming off the things..Pietzo pickups..probably don't sound worth a crap without an electronic pickup. I'm surprised he didn't add a TP holder to the other one.. 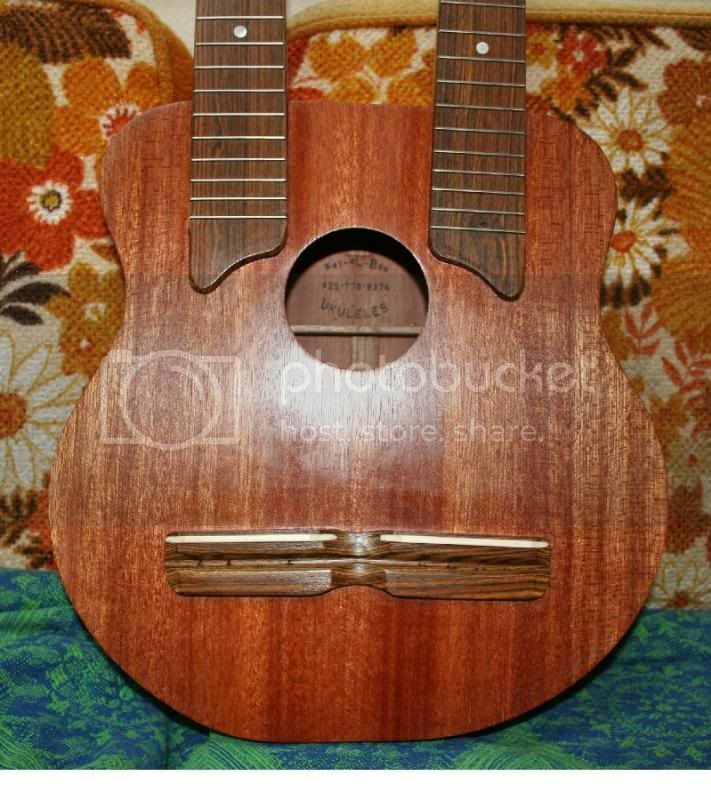 Here today..and Goin' to Maui(to an entertaining friend) as soon as I get another one started and building for myself...4 string baritone top neck and 8 string tenor bottom with an equalizer and dual pickups..Tomorrow I buy strings...(closed on the Fourth of July I imagine). Looks like another fine project, Cuz. 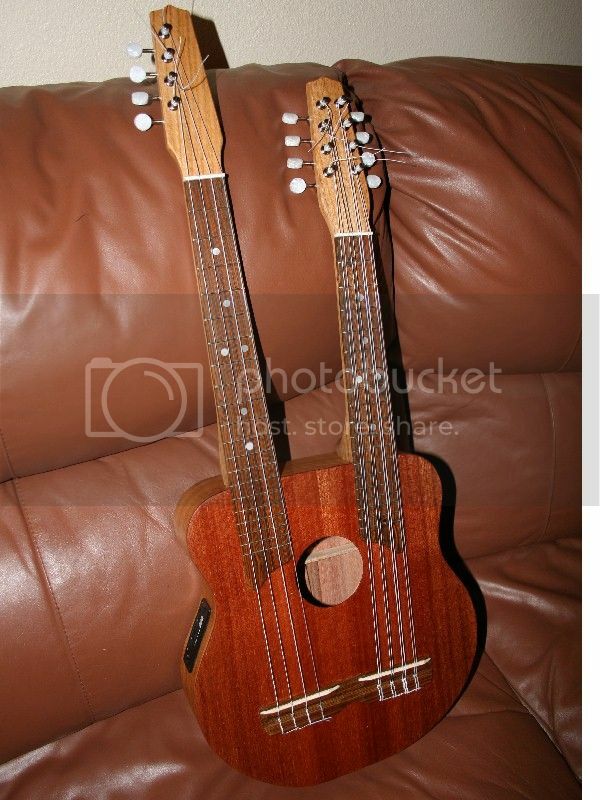 What is the purpose of two necks; different sound range? You've become a master of fine woodworking....congratulation on a piece well done. Maui will never be the same once they get their eyes on your new creation Every Don Ho will want one The stove making world misses you but we wish you well on your new adventure. You sure have had some change of weather up your way. 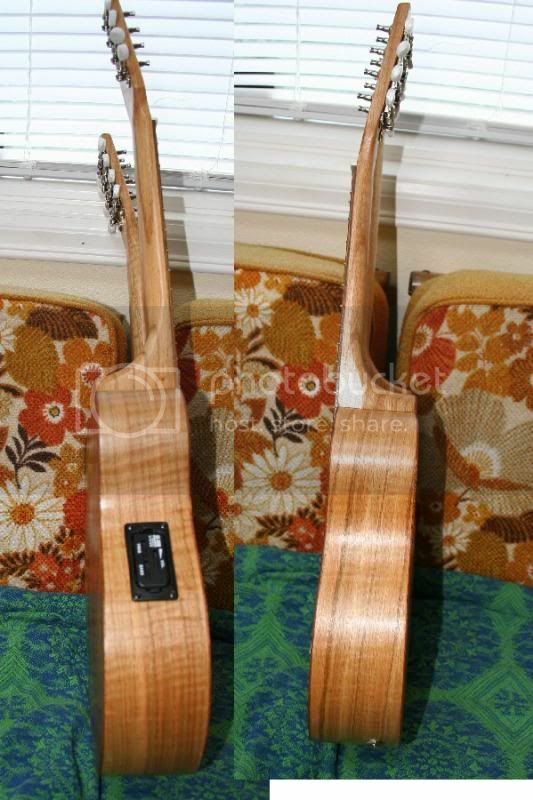 Two necks..top one is a lower 4-string baritone 19-1/2" scale tuned to the four higher strings of a guitar..DGBE. 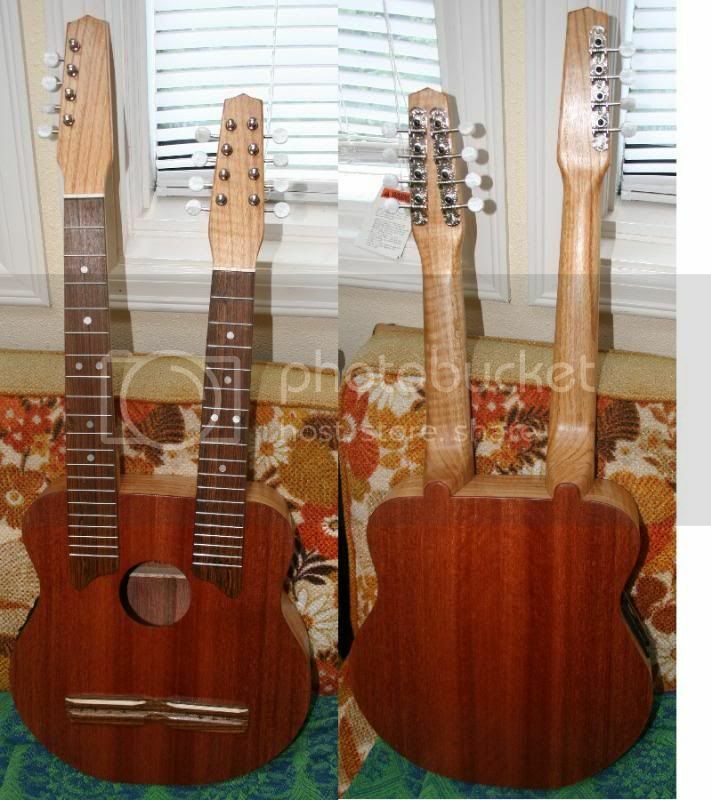 The lower neck is an 8 string tenor with 17" scale and GCEA strings..the G strings have two octaves and the other sets are matched as far as octaves(the friend's preference in strings and placements).Consider the sound of a 6 string guitar compared to a 12 string guitar..same idea and somewhat same sound change(4 verses 8 to 6 verses 12).. It's interesting to play because the two necks use different chord patterns for the same notes..A G chord on the baritone is a C on the tenor..an F on the baritone is a Bflat on the tenor,etc.Some chord patterns are the same for both necks..but become different notes.If you put a capo or stop on the fifth fret of the baritone,it becomes the same chords as the tenor..except the sound of 4 strings verses 8,of course. Interesting to play..You can pick bass notes/strings on the baritone neck and play the chords on the tenor..
Just got the strings on and breaking them in..see if this works and gives you an idea of the different necks and how they sound.. Sorry..I do have to stop and think about the same chords on the different necks..It would take time for me to play it fluently on both necks and I just strung it up a couple hours ago..